In timp ce pedaleaza, incepe sa ninga cu fulgi mari de zapada. Isi aduce aminte de un puzzle pe care l-a rezolvat zilele trecute. Plasati cifrele de la 1 la 6 in grila de mai jos astfel incat sa apara o singura data in fiecare hexagon, pe fiecare linie si pe fiecare linie oblica indicata de sageti. While he bikes, it begins to snow with enormous snowflakes. This reminds him of a puzzle he had solved some days ago. 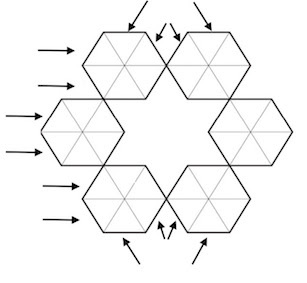 Place the numbers from 1 to 6 in the grid below so that they appear exactly once: in each hexagon, in each line and in every oblique arrow indicated by the arrows.